I have been a Star Trek fan since 1979 when the first Star Trek film was released. Star Trek: The Motion Picture. I remember seeing that film while I was visiting a cousin down in Oceanside Calif. Ever since then I have been addicted to ALL things Trek. I have attended many Star Trek conventions around the country and I have met with many of the key Star Trek actors or actresses. I am an avid Star Trek collector of Star Trek memorabilia such as Star Trek movie posters, Star trek plates, Star Trek computer games, and all Star Trek books both hardcover and paperback. This is not my first command of a Star Trek group as I was former President and Chief Organizing officer of Starbase:OR.CA. We were an independent Star Trek club based out of Southern Oregon.and this is how it all began. That first club had local chapters in Yreka CA, Crescent City, CA, Roseburg OR, and Klamath Falls OR. Over all we had a club membership of over 200 Star Trek fans from around the region. That club was closed when I relocated down to Las Vegas NV back in 1999. As the USS Las Vegas’ Admiral it is my obligation to help promote and organize club meetings and keep all crewmembers up-to-date on all the latest happenings in the world of Star Trek. There are several major KEY events current being planned during this 52nd anniversary of Star Trek. 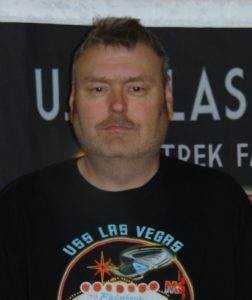 As a Star Trek club based here in Las Vegas NV we will be very involved with some of them. We will also be organizing local away missions to various Las Vegas area attractions and Las Vegas shows on the fabulous Las Vegas Strip. I would like to establish and maintain an open dialogue with all Star Trek fans and encourage them to join us officially here on board. I can be reached via email @ trekfan0001@yahoo.com or on my cell at 702-689-5580. You can snail me if you desire to USS Las Vegas Star Trek Club C/O Paul Walker Jr. 2825 Bluegrass Ln. Apt. 904, Henderson, NV 89074.